Gibson ES-335-12 Model 12 String Semi-Hollow Body Electric Guitar (1967), made in Kalamazoo, Michigan, serial # 118815, cherry lacquer finish, laminatad maple body; mahogany neck with rosewood fingerboard, brown hard shell case. Gibson's first single-neck electric 12-string, the ES-335-12, was introduced in mid-1965 in response to the 12-string craze which followed George Harrison's featuring of a Rickenbacker 360/12 in the prior year's "A Hard Day's Night". 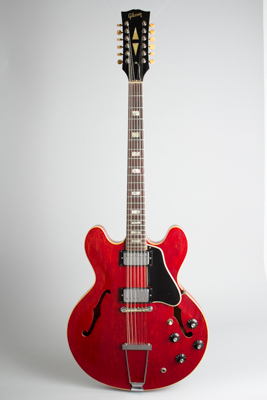 The model was a straight adaptation of the standard 335 design, with only an extended headstock and 12-string tailpiece as alterations. The 12-string ES-335 was fairly successful over the next couple of years but was phased out of production in 1970, so is now not nearly as plentiful as its 6-string sibling. This example was built during 1967, one of 597 made that year -- the model's production peak. It sports a vibrant cherry finish, chrome-plated hardware, and the later '60s-style "Witch Hat" knobs typical for this year. This model was used by Robbie Krieger on the Doors' "Love Her Madly" and Richie Furay of the Buffalo Springfield, as well as the Beau Brummels and many other period Rock acts. The ES-335-12 remains one of the 1960s' better-sounding and playing electric 12s; a fine instrument, even if not generally considered an all-time Gibson classic. Overall length is 43 3/4 in. (111.1 cm. ), 15 3/4 in. (40 cm.) wide at lower bout, and 1 3/4 in. (4.4 cm.) in depth, measured at side of rim. Scale length is 24 3/4 in. (629 mm.). Width of nut is 1 5/8 in. (41 mm.). This guitar is an excellent player with some light wear and one restoration -- the original plastic button Kluson Deluxe tuners have been remounted, with no visible disturbance. The switch tip looks later as well. There are a few small dings on the back of the neck, body, and headstock edges and some typical checking to the lacquer. The frets have a bit of wear but not enough to affect playability. This is a powerful-sounding and fine-playing electric 12, with a modern HSC. Excellent - Condition.